"One the big draws for basing myself in Saigon is for the cafe culture. There are few cities in the world that can match the amount of cafes that are here. I spend my days mixing it up between working in my room and working from two cafes per day. I have the opportunity to meet up with fellow location independent travellers, or working anonymously in a cafe in one of the many cafes around the city. I like that there is a mix of traditional cafes serving Vietnamese coffee and western cafes that serve espresso coffee. While the quality of the western coffee is still lagging it is catching up". Is it Ho Chi Minh or Saigon? Since the end of the Vietnamese war, the official the name for the conurbation as a whole has been Ho Chi Minh City (HCMC). However, the city centre is still officially called Saigon, which is the city's traditional and historic name. In fact, the city appears as Sai Gon in all Vietnamese railway timetables, it will say Sai Gon on your train ticket and as you can see from the photo, it actually says 'Sai Gon' in big letters on the station itself. The ruling elite may toe the line and call it Ho Chi Minh, but everyone else calls it Saigon. So do what the locals do, call it Saigon! Ho Chi Minh City - (HCMC) is the business and financial centre of Vietnam, with a prominent history that goes back hundreds of years. The Khmers originally ruled over the area, but the Vietnamese took over in the 17th century. The French conquered Saigon in 1859, and they made it the capital of Cochin China (South Vietnam) in 1862. This resulted in numerous colonial architecture and wide boulevards, which today are still present. At the height of the Vietnam War in 1969, the city had 4.5 million residents, all of them were evacuated when Saigon and the rest of the South was conquered by North Vietnam in 1975. The city has recovered over the last 40 years and has now a current population of over 7 million. The name of the city was renamed from Saigon to Ho Chi Minh City. Named after the spiritual leader of the North Vietnamese communism, but because the people are so reluctant to use this new name, they still call the centre of the city Saigon. Nowadays Ho Chi Minh City is a popular tourist destination, because of its fascinating culture, classical French architecture and sleek skyscrapers, as well as the ornate temples and pagodas. The city is also filled with bars on roof terraces, which are looking over Saigon and beyond that, it has fantastic restaurants, the kitchen in Saigon has French, Chinese, and, of course local Vietnamese influences. Because of the convenient location close to the South China Sea Ho Chi Minh City could grow to an important traffic and trade hub for Vietnam, but also for Southeast Asia. 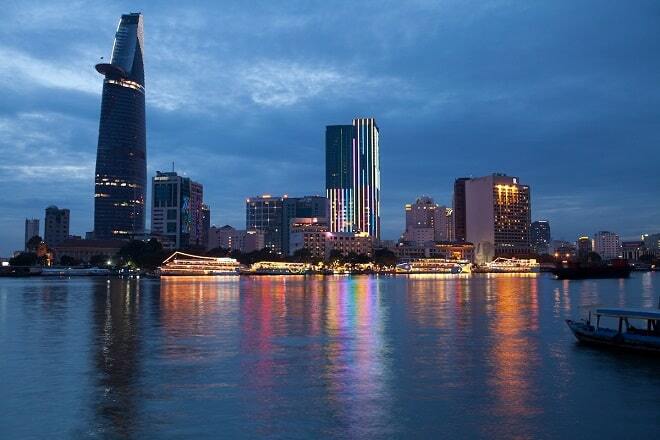 Because of this Ho Chi Minh City plays an important role for the Vietnamese economy. The economy of Ho Chi Minh City runs on many pillars. So there is mining, fishing, agriculture, manufacturing, tourism and Ho Chi Minh City is also a financial centre. In the area of trade in Ho Chi Minh City plays a major role in Vietnam. Ho Chi Minh City has many shopping malls and markets like Ben Thanh market. Most tourist attractions of the city are within walking distance of each other in the centre, in Quận 1 (district 1). This backpackers district exchange narrow streets together with busy streets where everyone on low chairs enjoying a beer and South Vietnamese food. Here include the town hall, the zoo and botanical garden, Saigon Notre-Dame Basilica, the Opera House, the General Post Office, Reunification Palace and the War Remnants Museum is located. The Bitexco Financial Tower is located in this district. The Skydeck of this skyscraper is visited by tourists because of the views over the city and the Saigon River. The Chinese district of Cho Lon with the Thien Hau Temple is popular with tourists, as well as day trips to the Mekong Delta and the Cu Chi tunnels. The city also has a number of theme parks, such as Suoi Tien and DJAM Sen.
Due to the rapid growth of the city Ho Chi Minh City has an inefficient road network. In the center of the city traffic is far too busy. Traffic can still best be described as an anthill of scooters between taxis, cars and buses, which are trying to clear a path. This makes public transport by bus in the city very inefficient. There are 3.5 million motorcycles and scooters in Ho Chi Minh City and therefore it is the best way of transportation. But the car is becoming more popular. There are about 340 000 cars in the city and this number is rising rapidly. There are plentiful taxis and even though of them most have a taximeter, it's quite normal to negociate in advance about the fare. Especially for longer distances, such as from downtown to the airport. 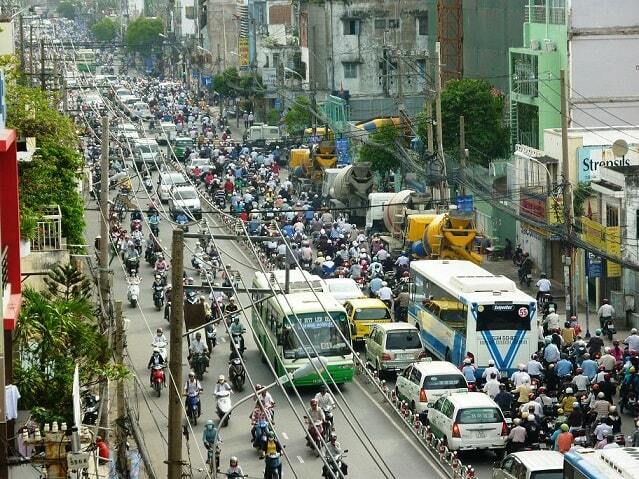 To resolve the transport problems in the city they have started the construction of the metro in Ho Chi Minh City. This will consist of five lines. The first line is expected to be completed in 2017 and has to handle more than 160,000 passengers every day. By rail Ho Chi Minh City is connected with Hanoi. The main station, Saigon Railway Station, still recalls the ancient name of the city. This railway station is in District 3, Ho Chi Minh City and is the largest and busiest station in Vietnam. 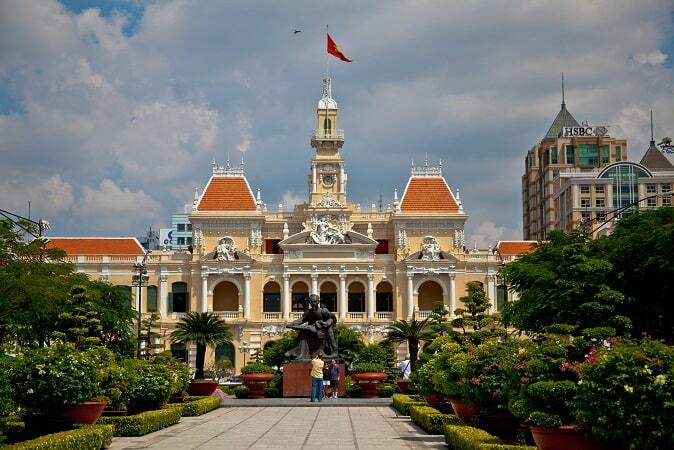 Ho Chi Minh City is located in the tropics and has a tropical savanna climate. This makes that there are only two seasons Ho Chi Min City, the rainy season and the dry season. The rainy season lasts from May to November, the dry season from December to April. On average, Ho Chi Minh City 270 hours of sunshine per month. Most rain falls in the north of the city. 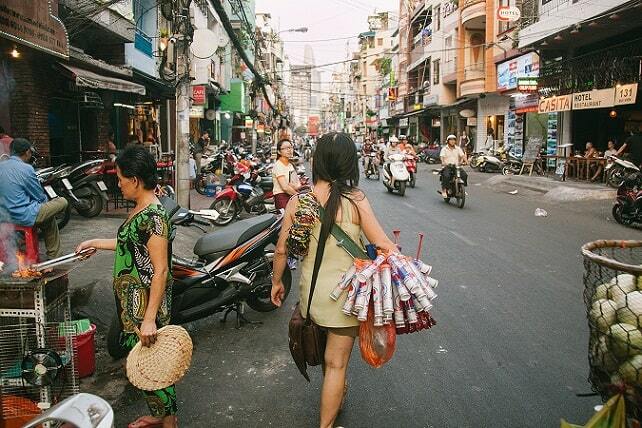 Ho Chi Minh City is known for its pickpockets, in relation to other Vietnamese cities. It is therefore important to leave valuable things in the safe in your hotel or hostel. Put your money and passport that you carry with you in a pouch under your shirt. Do not carry a bag on your shoulder, but wear it diagonally across your body. Ho Chi Minh City has an international and domestic airport. So it is possible to fly to another Vietnamese city and from other countries to Ho Chi Minh City. Between Hanoi and Ho Chi Minh City is also a train connection. This journey takes about 27 hours and costs about � 32.